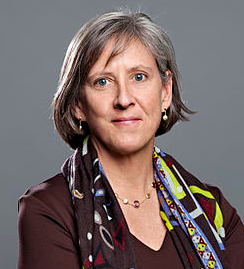 Mary Meeker's annual internet trends report 2014 doesn't disappoint - its 164 slides are chock full of data points and insight into the most important consumer trends this year. Smartphones are now so ubiquitous in the UK, US and other developed markets that it comes as a bit of a surprise that majority of the world mobile population is still on "dumb devices". These range from super old Nokias that only do calls and SMS to smart-ish Symbian phones with apps, internet browsers, etc. Global smartphone penetration stands at 22% today, and with growing numbers of cheap Android handsets not only from well known brands like Samsung but also from regional players (Chinese Xiaomi, India's Micromax etc.) this is bound to change quickly over the next couple of years. 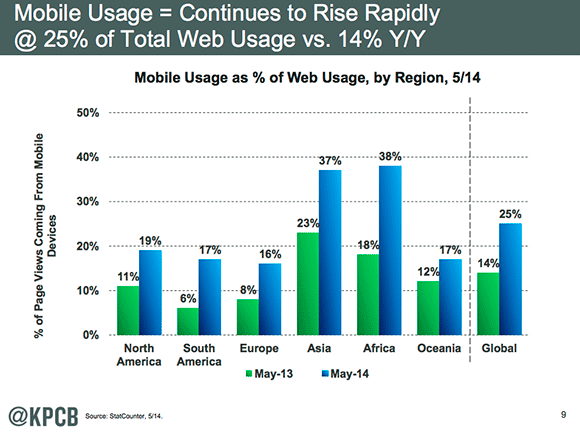 Mobile as a source of web traffic continues to grow quickly. Asia and Africa are driving the growth and will remain leaders when looking at how many people are yet to get a phone and come online. Note that the graph doesn't reflect mobile app usage, just pure web browsing. International Advertising Bureau estimates that mobile accounted for 20% of time spent in media in the US in 2013. However only 4% of advertising dollars were invested into mobile. 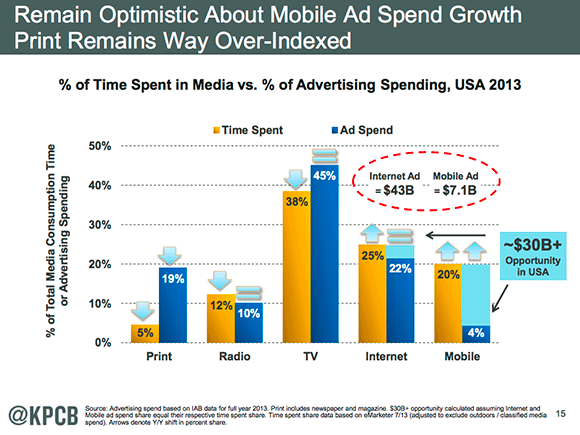 The massive gap means that just in the US there's a $30B+ opportunity in mobile advertising. Some of it can be put down to mobile being a relatively new medium, best practices in advertising haven't emerged yet etc. The challenge for brand advertisers is that until now there hasn't been a good way to measure the advertising effectiveness of mobile brand advertising. 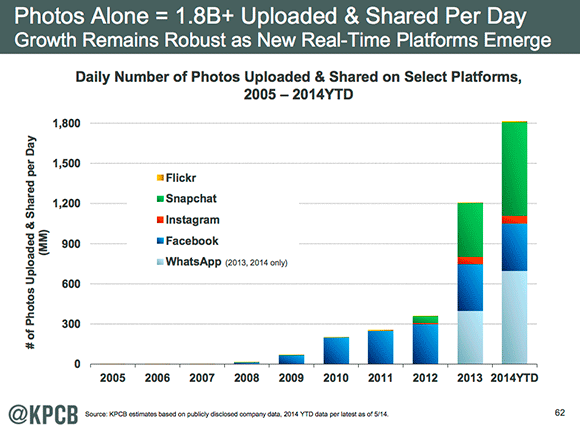 WhatsApp and Snapchat have completely changed this graph in just two years. The way people share photos on these platforms is very different from Facebook and Flickr as well - the photos either self destruct (Snapchat) or disappear into the chat history very quickly. It's private, it's often one-to-one, and its short-lived photo sharing. It's worth keeping in mind that Asian giants like WeChat, Line etc haven't broken out the number of photos being shared on their platforms but judging by the number of registered and active users their numbers could be in the same ballpark to WhatsApp and Facebook. Will there be a similar explosion in video next? A 30-country study on multi screen usage a few months ago revealed that mobile is now the first screen. Marketers and brands need to consider screen shifting, stacking and meshing to best reach their target audiences. See our in-depth post about multi screen usage. 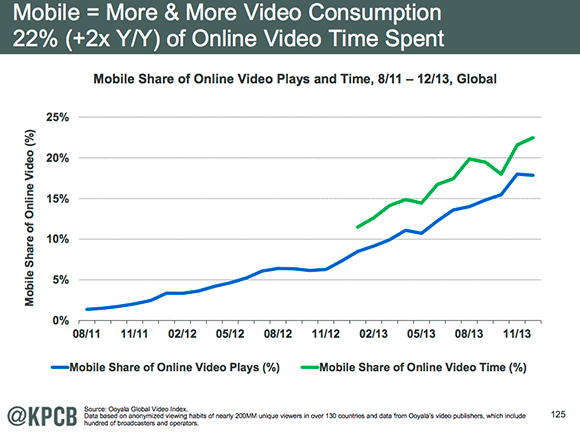 Mobile share of online video time is rapidly growing, it now stands at 22%. A recent survey we conducted in Indonesia revealed that over 80% of mobile internet users have watched at least one video on their phone within the last week, 35% watch video on their phone several times a day. Cheap smartphones flooding the market combined with tumbling mobile data prices and better coverage mean that strong growth in smartphone penetration and mobile internet usage will continue over the coming years. While mature markets are fairly saturated potential in emerging and growth markets is still huge. Speaking of growing markets then China has it's own very interesting section in the report. China is already the mobile commerce leader with 400 million active users for mobile payments. The growth and potential there is simply mind boggling.